Happy Graveyard Orchestra is a young ensemble working from London. 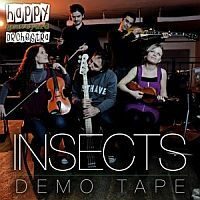 Recently, they released their first demo tape, entitled Insects. On first hearing, this band certainly was one-of-a.kind, with almost punkish guitars and dual strings (violin and viola). The guitars, bass and drums form a heavy rock backdrop, with the strings adding an almost chamber music feel. There is the occasional resemblance to Kansas and chamber rock bands, though not very often. The quirky and fun music and lyrics do take on hints of Zappa, but yet again, you can't really say Happy Graveyard Orchestra borrow too much from any particular artist. With this demo tape, Happy Graveyard Orchestra show a great deal of potential. They have an abundance of talent and strong writing. Certainly a band with great promise for the future, when they will certainly not be Insects but more likely bigger animals in the kingdom of experimental and progressive music.